Product prices and availability are accurate as of 2019-04-12 21:04:35 EDT and are subject to change. Any price and availability information displayed on http://www.amazon.com/ at the time of purchase will apply to the purchase of this product. Consumer-rated unbeatable photo quality and full-featured functionality make the Expression Premium XP-810 the ultimate choice for printing. Ultra powerful and ultra slim, this space saver produces stunning borderless photos and documents quickly and affordably. Featuring the ultimate in wireless printing, the XP-810 makes it easier than ever to print from your iPad, iPhone, tablet or smartphone, whether in your home or out and about. And, it boasts 2-sided printing, plus a 30-page Auto Document Feeder for auto 2-sided copying, scanning and faxing. The intuitive 3.5" touchscreen, dedicated photo tray, specialty paper support and CD/DVD printing mean you’re ready for any creative project. 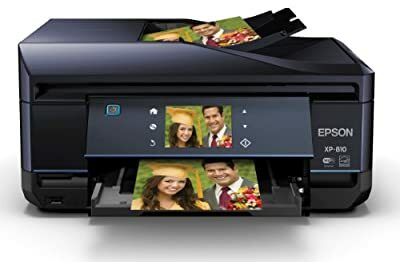 Validated through independent testing, the XP-810 offers consumer-rated unbeatable photo quality when compared to leading photo all-in-one printers. Print and display brilliant borderless photos — 3.5" x 5", 4" x 6", 5" x 7", 8" x 10" or larger — anytime. Print wirelessly from your iPad, iPhone, tablet, smartphone or laptop computer with Epson Connect. Easily print documents, photos, emails and web pages from the comfort of your couch, your office, or across the globe. You can even scan your documents and save them to the cloud. Quickly tackle stacks of 2-sided originals at one time with the 30-page duplex Automatic Document Feeder. Scan or fax that 2-sided contract to your co-worker’s email in seconds. The XP-810 handles it all, plus 2-sided printing and copying. 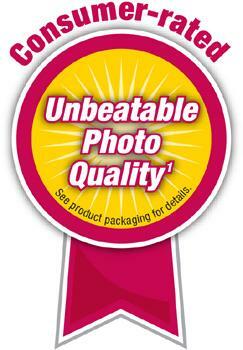 Get superior image quality whether you’re printing photos or text. Print brilliant borderless photos to share with family and friends, or an intricate document with crisp, sharp text. Borderless Prints up to 11" x 17"